FTP connection to specific servers fails through the Security Gateway. There are a number of reasons why FTP connections to specific server sites fail. When certain size or types of data message comes back from the FTP server, the Security Gateway closes the FTP connections. After applying the changes suggested in this article, test them by trying to FTP to ftp.cisco.com and to ftp.hp.com. If you are successful with Cisco, but not with HP, then try the suggestions outlined in sk41490 (How do I allow FTP on ports other than port 20 and 21?). Use a lower security enforcement, designed for optimal connectivity, which does not demand "newline" characters. (This enforcement also does not check port commands for bounce attacks and dynamic ports.) Define and use a new service, for example "ftp-new", using the protocol type FTP_BASIC in the following way. Open the Services window ('Manage > Services') in SmartDashboard. Create a new TCP service. Call it "ftp-new", for example. In the "Port" field, configure the port to "21" (FTP standard port). Click the "Advanced" tab, and set protocol type to FTP_BASIC. 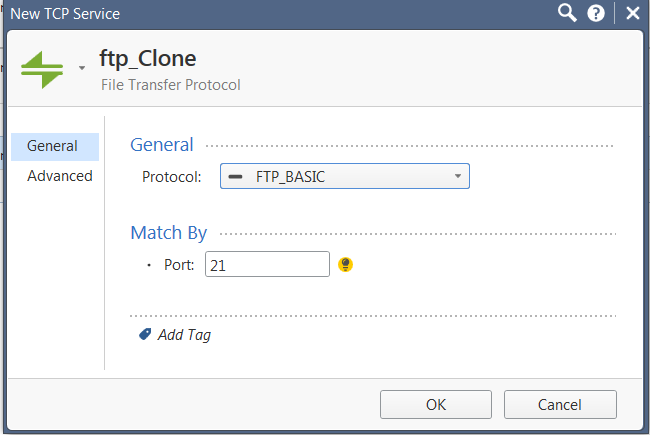 Note: In R80.x, clone the ftp service and set the protocol. Clear the box "match for any". Use the service in the relevant rules, and install the Security Policy. If these steps do not work, perform one of the following steps based on the version of Security Gateway that you are using. Refer to sk95147 (Modifying definitions of packet inspection on Security Gateway for different protocols - 'base.def' file). Issue cpstop from the command line, stopping all services on SmartCenter. Issue cpstart from the command line, starting all services. Reinstall the security policy. This enforcement recognizes the suspicious FTP packets and modifies them to be harmless instead of dropping them, and records a proper log message. Additional Note: VSFTP server may require to use both the predefined service "FTP" and a custom service FTP service with the protocol type "FTP-BASIC"
To resolve this issue, increase the Maximum Segment Size (MSS). Instructions can be found in sk41199.